A source close to the singer has said that the album is not to do with her. Ariana alter ego debunked by a source close to the singer. 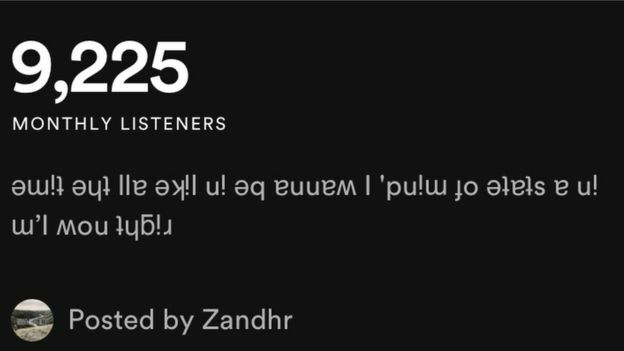 It was not long ago that fans begun to notice that there was a new artist on the curb going by the name of Zandhr, and it was believed that the vocals seemed quite similar to the pop star that is globally loved; however, these rumours have been denied by a source very close to the singer. There were many songs uploaded to two main streaming platforms in Spotify and Apple Music, including songs titled "Fiesta", "Ridiculous" and "Cadillac", however as of Tuesday 6th November, they have begun to be removed. It comes with shock as fans were absolutely convinced that they could hear Ariana Grande's vocals on the tracks, with many spreading the news on Social Media about the existence of the album and many referred to it as a surprise; however, it has been pointed out by some die-hard Ariana Grande fans that some of these songs in the playlist are, in fact, not a secret and have been online for a while or even already released on YouTube. Some of the shocked listeners have noticed that the Biography of this alter ego appears to say "Right now I'm in a state of mind, I wanna be in like all the time" which is from the song "No Tears Left to Cry" and from the Sweetener album, leading to fans believing this may be the songs that did not make the cut for official release but were still able to amaze the world. It still remains a mystery as to who Zandhr is and they are not letting up the source of all of this music. They also do not state a clear reason as to why they are doing this; however, we do know that Ariana has previously loved dropping hints and lyrics to her upcoming songs, and this could indeed be a creative way to do so. Ariana Grande is yet to make an official comment herself; however, we do know that she is not completely inactive online as she has been retweeting and liking reactions to her new song "thank u, next" which has already been released following her break up from Pete Davidson and features mentions of Mac Miller who recently passed away. Who do you think zandhr is? could it actually be Ariana? Listening to some sound samples on Twitter, I can definitely hear Ariana Grande... the mystery continues? Interesting article!